Below is a list of activities being held during DVT Awareness Month. If you know of any DVT Awareness Month Activities that are not on this list, please let me know. You may contact me at webmaster@clotcare.com. The UNC Thrombophilia Program at the Carolina Cardiovascular and Biology Center and NATT (The National Alliance for Thrombosis and Thrombophilia) have informed us that they will be offering a free seminar on blood clots. 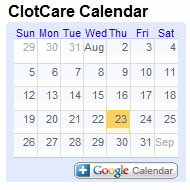 Learn more at http://www.clotcare.com/clotcare/bloodclotseminar.aspx. On March 7th, the Coalition to Prevent Deep-Vein Thrombosis (DVT) will lead DVT survivors, their friends and family, DVT Coalition members, and local dancers to "kick off" DVT Awareness Month 2006 by attempting to set the Guinness world record for the longest kick line. Learn more at http://www.clotcare.com/clotcare/dvtcoalitionkickoff.aspx.